Finished in 1:12:44(official) A new PR I guess since I've never done a double. Another successful Kona Running Company event. Great communication, excellent organization, cool race swag, well organized. This is the theme of Kona events. If you have not run one, you are missing out. Registration is very easy with the Kona races. Just go onto their website, click register and it will take you to their registration site to get signed up. Very easy as most races handle registration this way now. You also had the option to register the day of the race too at the expo or mail in as well. I actually mail in my registration. There was a couple options for packet pickup. You could come on the Saturday before the race or you could pick up that morning. 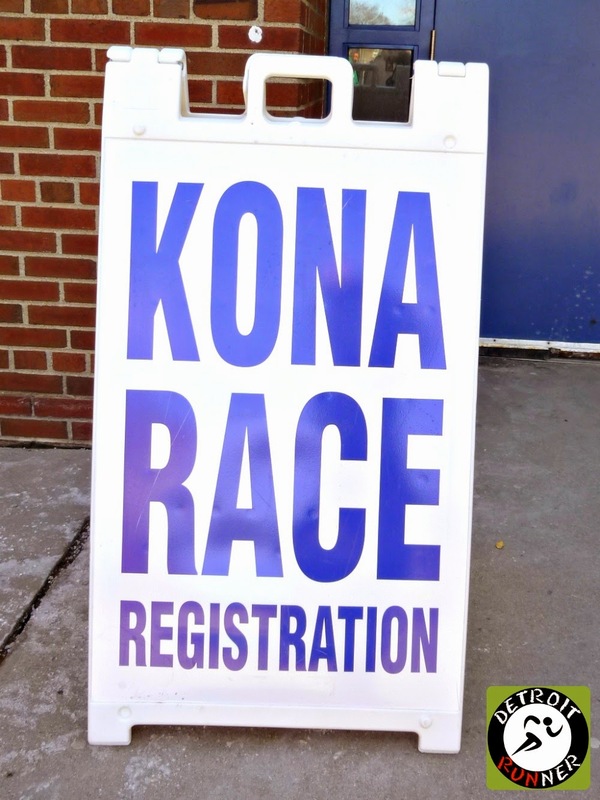 I think all races should offer two days to pickup packets and Kona has always offered it. The packet pickup is at the local school and, once again, I was able to volunteer for the race so I got my packet early too. I love volunteering for packet pickup because you get to talk with all the runners and it's always a fun time. If you have not volunteered for a race, try it, it's fun! As you came into the gym, the race had a small expo set up for the runners. Well, yes it was small but it was larger than it's been in past years and it's larger than some half/full marathons I've raced so it's a nice venue. I love expos as it's fun to see what the sponsors are offering to the runners. After the runners came through the expo, they could look up their number on the wall of names. Of course, the race also gave the numbers out on their site as well but many people forget them so the race had them ready for people. Once they had their number, they would come back to us volunteers and give us their number so we could give them their race packet. The packet this year was a Kona Running Company beanie, short sleeve tech shirt and your bib. Also, if the runners wanted to register that day or if they had an issue with their name or registration, the race was able to fix it right then. Also, the race offered exchanges of shirts this year at the packet pickup instead of after the race. 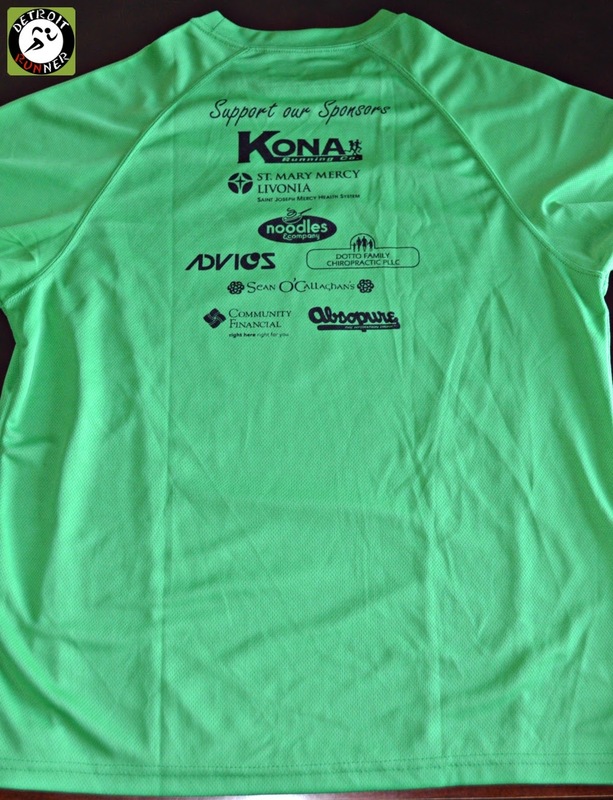 You could also purchase Kona merchandise at the Kona store if you wanted another race shirt from a previous race. The race also had a new item this year which was a piece of the Blarney Stone from the Blarney Castle in Ireland. Basically, you kiss it for good luck. I didn't kiss it and, hence, no PR for me this year. LOL. If you want to read the history of the Blarney Stoney, go HERE as it's an interesting story. A fun idea for the race! The race also had a band playing at the expo and those guys were REALLY good. The next day it was a very early start. I'm used to an early start with Kona since Plymouth is about an hour away from my home but it was an even earlier start since I was running the Dublin Double. The first race was at 7:30am. The Dublin Double is running the 10k first and then running the 5k next. It was the first time that Kona has offered a double race and I thought it was a great idea. It was also the first time I've ever run the 5k course since I always opt for the longer race. Parking for the race was very easy as we decided to pay the $5 the City of Plymouth was charging to park in their lots. Half went to the City and half went to the Lions Club and they had Lions members there collecting the fee. The race also offered a free shuttle to a lot a couple miles away. 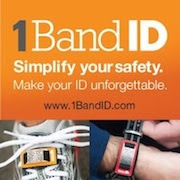 We didn't use it, but I've already heard from several runners that used it that it was easy and worked well. Personally, I thought it was worth the $5 to be right next to the start area. We waited in the car for about half hour until it was time to race and parked right next to the finish line. The start area had a band playing by the farmers market as well as a warming tent right behind it. It was a life saver this year since it was so cold out. Behind that was the tent with the food. All of it was well organized. The band playing was great too. They were very talented and had a great variety of music. This time around, Kona had more than enough Port-o-Potties at the start and on course. This is one of the best things in regards to this race company, they do listen to what their runners request. I will say that you cannot please everyone(especially us spoiled runners) but Kona does it's best to please everyone and learn from every race they do each year. Before we knew it, it was time to run! The sun was not even up yet! Morgan Whitehead sang the National Anthem as she does for every race and we were ready to go! The plan for me was to run the 10k but not as full speed so I could save some energy for the 5k. Since I have not done a double race before, I didn't know what to expect but it was great to try a new challenge. We started off a little slow in the beginning but once past some of the slower runners, we were able to pick things up. My buddy Rich and I ran together. I kept telling him I was just trying to keep up with him but he said he was trying to keep up with me. As you can see, we had a nice negative split and while it was not a PR for either of us, we had a great time pushing each other. I was also pleasantly surprised with my results with the 5k. Again, not a PR but it was nice to see my pace picked up faster than the 10k. I was surprised considering running 10k plus the downtime between races. Also, look at those splits! I don't think I've ever been so even! This year the race had three waves to help ease the congestion. This is why we had to leave home so early. The race start was 7:30am for the first wave of the 10k and they had two others at 7:40am and 7:50am. People running the Dublin Double were directed to run the 7:30am wave and the 9:00am 5k wave. There was also a 9:10am and 9:20am wave for the 5k. As you can see, it was pretty crowded at the start, like many races. It was also still dark out so please excuse the poor pictures on the 10k course. Pictures come out better with good lighting when you are running at the same time. Before I knew it, we were already at the one mile marker. It was freaking freezing out! I think this had to be one of the coldest Kona races that I've ever run with the temperature at 18 degrees to start. It was windy too! Lots of people were dressed up for the race. I'm not a guy that gets too festive but I did have my "Shamrock It" Headsweats beanie! The sun started to peak out of the sky about the three mile mark for me. It's moments like this that I love running. Nothing better than running as the sun is coming up. Not that the sun got us any warmer but the sun certainly helps your mental attitude. The race had the police for Plymouth out helping on the course as they always do. The Plymouth police department always do a great job and I always try to thank the officers as I run past them. The course was really clear of ice and snow. This was really the only place that I saw ice of any significance which was nice. You really were not worrying about this during the whole race. I love this part of the race. As you can see, there were not as many spectators out likely due to the really cold temperatures. Really - who wants to stand there and watch runners when it's this cold? Ha! We finished the race and skipped over taking our 10k medal. While I saw many Dublin Double runners taking their 10k medal after this race, they were supposed to leave it and collect it at the 5k. This is what we did and it worked out great. This way we didn't need to run with it or go back to the car. The volunteers made sure to ask if we had already taken our 10k metal which we didn't. My hope is that nobody took another one. Because we were doing the Dublin Double and with a finish under 50 minutes, we had about 40 minutes to wait until the next race. Frankly, I was really concerned about this because of how cold it was. I was worried my muscles would start to tighten up, I would cool down and my sweat would freeze and get too cold waiting for the 5k. I even brought extra shirts and a hat to change into after the 10k but I didn't need them. I really had nothing to worry about. First, Kona had the warming tent to keep the runners warm not only after you were finished with the 10k but also for those running the double. Without this, it would have been crazy cold so this was a life saver. Second, while I didn't get any, there was water and coffee for the runners so we could have warmed up with that but I didn't want to drink it then do another race. I also had the option to go back to the car if needed but the warming tent was warm enough and I didn't even have to change. We listened to the great band as we were waiting for the 5k start. Next up was the 5k race. A group of kids did a song before the National Anthem. They also did this before the 10k too but since it was dark, I could not get a good picture of it. National Anthem #2 - ha! Once again, we were ready to race for the 5k. My muscles did stiffen up a bit so the start was a bit harder than the 10k. Also, there were many more slower runners in the front so I did a ton of weaving back and forth in the first 1/2 mile to get around the crowd. If I do a double again, I think I would probably line up closer to the start. As you can see, it was fairly crowded at the start but again they had three waves to help ease the congestion at the start. I think that many runners just didn't line up properly for the 5k race. Sometimes I feel like a linebacker in a football game and I make my way around people. Haha! It can even be fun as it was today! As you can see, once I got past the initial crowd, it eased up on the amount of people. Don't let that sun deceive you, it was still really cold even for the 5k race but the sun was glorious. It could have been much worse had we had a snow storm given how this winter has been so we were pretty lucky overall. At this point, we started coming up on 10k walkers. Fortunately, all the walkers were staying to the right so us runners could get by with no issues at all. Once again the end was near! Finish - race #2, the 5k! I felt like the 5k went really quick. We were able to get our two medals for each race and could make our way to the food line. The race had more port-o-potties out there at the aid stations. Frankly, I'm impressed they have any on course at all for a short race. The volunteers did an excellent job handing out water and Powerade. It was so cold so it's very appreciated that they stood out there to help us. One of the runners even yelled, "Free slushes" Yes, it was so cold the water was turning to slush! Kona had their typical race results board by the finish area. New this year was instant timing results for the race through XACT. You could get results sent to your Facebook or Twitter page or to an e-mail or text. I signed up to receive all for both races. 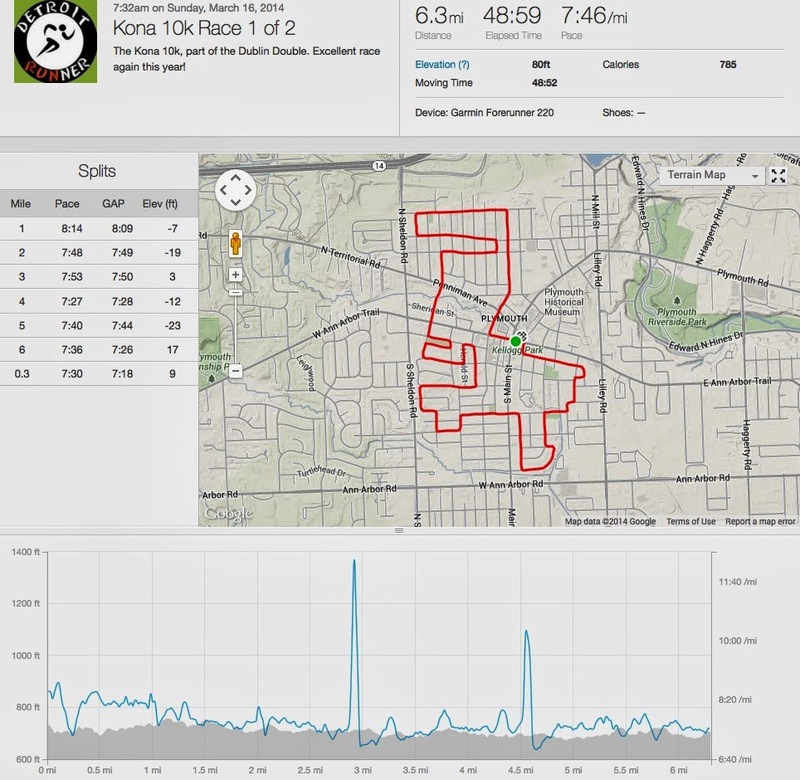 I received my 10k results but never received my 5k results(and neither did my buddy) for some reason. I've used this system in other races and it works well. The only explanation I can see that I didn't get 5k results sent was that I ran a double race. Fortunately, Everal Race Management is so efficient with results, by the time I got home, results were already posted on their website and through RunMichigan. Also, I noticed that Everal updated the way they report races on their site and it's much easier to find your information. 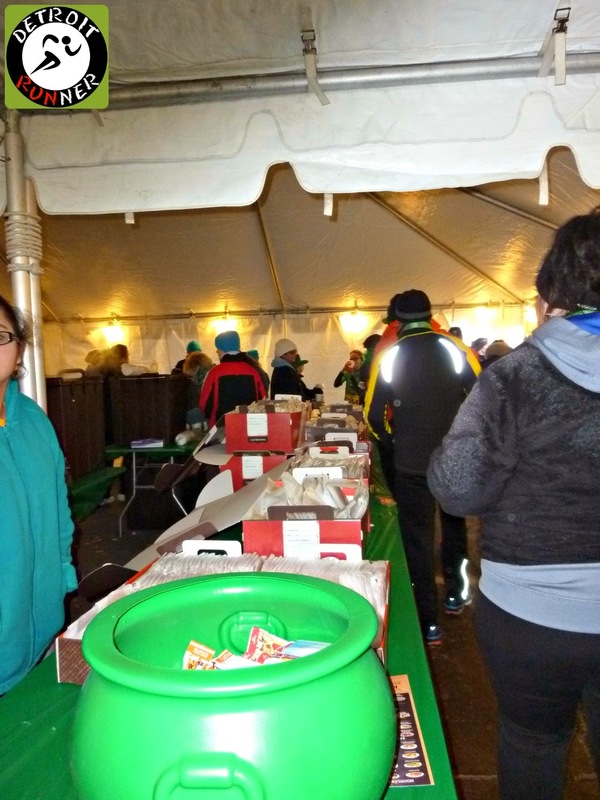 We made our way to the food line after the 5k. Kona always has the best food at the finish! This time around they had water, bananas, granola bars, cookies(from Panera Bread) and coffee. I will say that I was surprised not to see the bagels they usually have as I was looking forward to my Asiago Cheese bagel but the cookies were awesome(and my second favorite post race food) and it's nice to have something different too. As Kona always does with their bagels, they had the cookies all wrapped separately for the runners which is a nice touch. While I didn't have the coffee, it was a welcome item for the runners given the cold. I don't understand why other races don't offer coffee when they do cold weather races? After we hit the food line, we walked over to Sean O'Callaghan's Public House, one of the race sponsors, a block away for a couple beers for a pre-St. Patrick's Day celebration. While the place was crowded, we were able to walk in and get a beer right away if you didn't mind standing in the bar(which we didn't). We also met up with Josh, who was pacing both races for Kona. Even if you wanted to eat at the restaurant, it was only a 45 minute wait which I think is fantastic given the number of people downtown for the race. On the way back to the car, we actually stopped by into the food tent for the race as they were packing up and the volunteers were nice enough to give us some cookies and bananas for the road. It was nice to see because this meant that everyone received food at the finish line since there was leftovers. 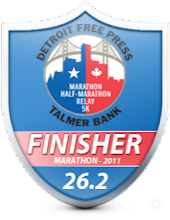 For your race entry fee of $63(if registered for the Dublin Double before 1/14/14), you received a safe, certified course for the 10k and the 5k. They also offered instant race results through XACT. They had entertainment at the expo and at the race. You received a short sleeve tech shirt, a great design I might add. 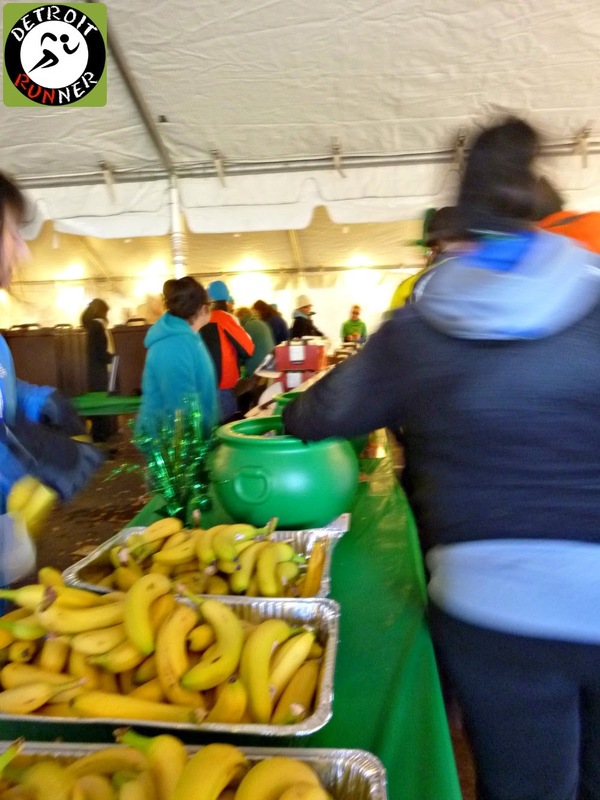 You also received some good finish line food as well as two medals, one for the 10k finish and one for doing both races. The medals are great quality and an awesome design. I would have liked to see the double medal be something other than a similar design as the 10k medal but they were still awesome! I do love that Kona changes their medals each year for each race so you don't get the same medal year after year. Kona also gave runners a Kona Running Company beanie which was a nice touch. My daughter pretty much took that as soon as I brought it home. Haha! A great value for what you get for a double race. I always hold Kona on a pedestal when it comes to race organization. The Kona staff really cares how runners view their races. Once again, in my opinion, the company did an excellent job with organization. They always keep the runners well informed for the races. 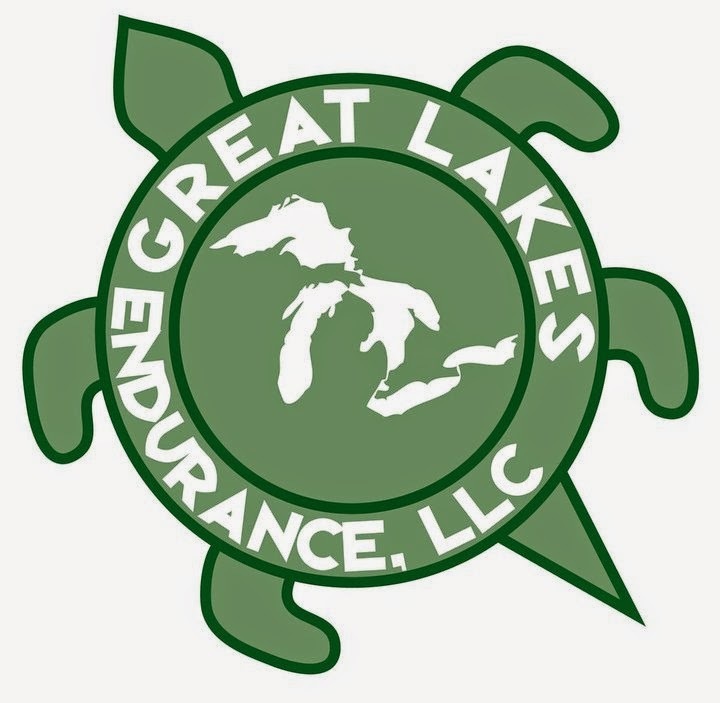 I think there needs to be a little more literature on the website about the double races as I think there were some runners confused what to do, being the first year offered, but we explained how it worked at the packet pickup. The start area was again excellent as well as the finish area. The food line ran smoothly. There are always volunteers helping and directing people where to go and Alan Whitehead, the race director, is always around both days working the area to keep things running smoothly. Overall, in my opinion, another successful Kona race in the books. This was my third St. Patrick's Day run with them. From the start of the weekend, Kona did an excellent job. They keep the runners informed, they keep the volunteers informed, they keep people happy and the listen to what the runners want and improve each year. I know I say this a lot with their races, but every year, I wonder how they will top themselves from the previous year. For me, it was clear this year it was the Dublin Double and the race beanies. I'm looking forward to their next race, the inaugural Novi Half Marathon in Novi. It should be a great time...and warmer! LOL. Disclosure: I received a complimentary race entry in exchange for this race review. All opinions are my own and I'm not required to give any opinion other than an honest one. 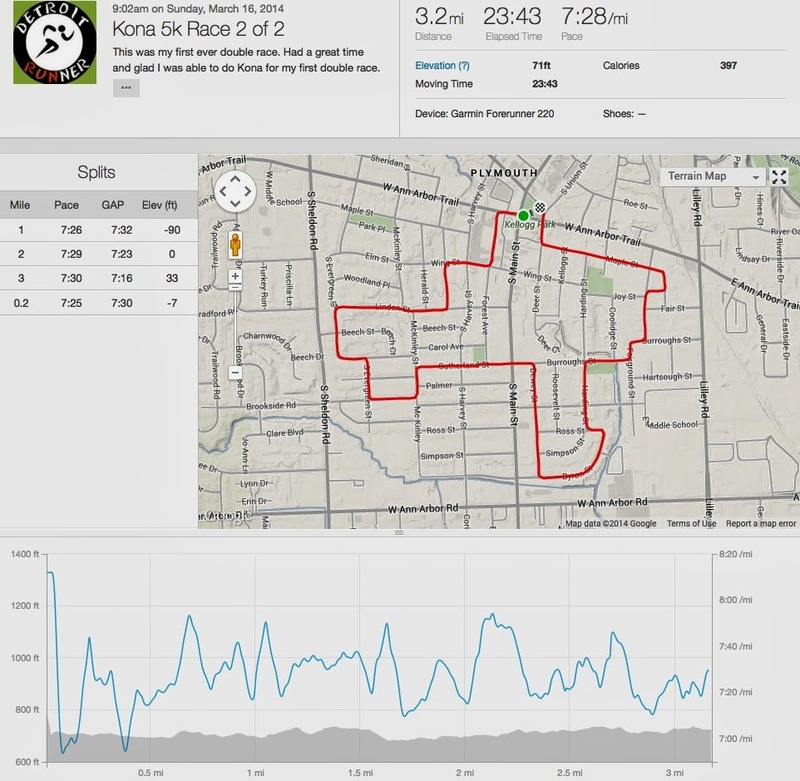 This was my second Kona run (1st St Patrick's Day run) and I have to agree with you...they really do a top notch job. I don't mind paying a little more than other races when I get the above average swag, course and pre and post race amenities. But damn, was it cold yesterday! Nice job on your first double! I've only done one and it was tough. That race had the 5K followed by the 10K. I went all out for a 5K PR then basically just survived the 10K. One nice thing about your race is that the courses weren't identical. That was one struggle I had in mine - 3 loops of the same course. Very nice that you had the heated tent for the downtime as well. I can't imagine how brutal it would have been to wait in that cold in between. Another great recap! No way I would do 3 loops. Yuck! It was so cold! I wasn't going to run both races but when I finished the 10K, the 10 minute sign was placed in my hands! I paced 65 minutes in the 10K which started in the 2nd wave so I had about 15 minutes between races. The worst was standing around waiting for the 5K to start in already sweaty shirt and gloves. I almost put the sign down and left! Afterward, I drove the whole hour drive home with the heat on high and the heated seat on high! I didn't know about getting both medals after the 5K; I wondered what I was going to do with the medal when I ran the 5K. I managed to stuff it into the little pouch on my shirt. I thought the same thing about the medals; they pretty much looked the same. I see you paced with Josh! Nice job. 40 minutes was long but at least we had the warming tent. Well run, now it's on to the Olympics for the 10 000m / 5 000m double... If Mo can so can you!! !